The milieu in Pakistan presents happy hunting grounds for terror mongers of various ilks. They find it prudent to have a happy nexus to achieve their heinous agenda of destabilizing the state of Pakistan at the behest of their foreign masters. The various components of this unholy nexus are the Tehreek-e-Taliban Pakistan (TTP), Lashkar-e-Jhangvi (LeJ), Baloch Sub Nationals (BSNs) and other terrorist organizations’ with one odious aim: weaken Pakistan and bring it to its knees at the bidding its foreign mentors. Even a cursory glance at recent events points towards this machination. The carnage, which resulted in the massacre of innocent Shia pilgrims in Balochistan, the attack on Karachi airport and suicidal attack on Security Forces at Boya; all within a span of 24 hours proves the fact that TTP, LeJ, BSNs and other banned terrorists outfits have an unholy alliance with a single aim to subvert Pakistan. Like puppets on a string, the nexus is manipulated to come into action and their sleeper cells are activated to strike at targets of opportunity. Their abhorrent agenda is one: create chaos and mayhem, cause enough bloodshed to traumatize the people, expose the weaknesses in the law enforcing agencies’ capacity and capability to defend their assigned vulnerable points and reduce the confidence of the masses in their leadership. All these detestable tasks are to reduce Pakistan to ashes. Their foreign masters synchronized these cowardly acts in darkness to hurt Pakistan domestically, regionally and internationally. Take the attack on Karachi airport and the firing on an international airlines aircraft in Peshawar. Both have caused the international airlines to reconsider operating through Pakistani airports. Gradually various airlines have terminated their operations to and from Pakistani airfields, completing the isolation of the war ravaged country. The 2009 atrocious attack on the Sri Lankan cricket team at Lahore has already removed Pakistan from the sporting map of the world. Foreign teams are reluctant to engage in sports fixtures staged on Pakistani grounds and stadiums. As a result Pakistani standards of sports has deteriorated, being deprived of opportunities to test their mettle with foreign teams on home ground. Pakistan’s sports industry has suffered badly and the people have been shun of the opportunity to witness sports tournaments on home ground, adding to their frustration and sense of deprivation. Who is the beneficiary of this bedlam and anarchy? The perpetrators of the original sin; those who move the strings of their treacherous puppets, willing to kill, maim and destroy at the bidding of their masters. Foreign support to the nexus of terrorists and miscreants is neither a figment of imagination of the Interior Ministry of Pakistan, nor a means to find scapegoats for their failures to preempt the treacherous assaults. The cache of weapons and chemical syringes recovered from the attackers at Karachi airport bore distinct Indian markings, leaving no doubt about their place of manufacture. This evidence is more than a smoking gun and is concrete proof of Indian involvement in manipulating the nexus of terror cobbled by India against Pakistan. Since the TTP claimed responsibility for the Karachi attack, then by default with the evidence of recovered Indian weapons, ammunition and chemical syringes from terrorists clearly indicates that RAW is directly involved in all terrorist activities in Pakistan. According to unconfirmed reports, the head of TTP, Mullah Fazlullah, who has taken refuge in Afghanistan, is enjoying not only the hospitality of the Kabul government but is also being physically protected by Indian spy agency RAW. The demoniacal attacks by the terror groups depict a method in the madness. The targets are carefully selected for their strategic value and after careful and meticulous planning, the assault aims at decimating Pakistan’s strategic assets. The demolition of Pakistan Navy’s maritime surveillance aircraft, the P3C-Orion, PAF’s AEW &C Saab 2000 equipped with Erieye Surveillance Radars, the attack on GHQ, attempted attack at Peshawar Air base to target the Cobra Gunship helicopters and fighter aircraft and the daring assault on Karachi air port were not meant to provide solace to the miscreants but to Pakistan’s arch enemy India, which stands to gain by Pakistan military’s loss to its defensive capabilities. TTP engaged the government of Pakistan in a peace dialogue for which it was never serious. Despite declaring a ceasefire, terror attacks continued incessantly, including the cold blooded massacre of FC officials in their custody and the release of gruesome videos of Taliban playing football with their severed heads. The TTP were in fact gaining time to launch a renewed barrage of assaults, which they did through their nexus in the Karachi Airport attack and others mentioned above. Pragmatically, the government of Pakistan gave the peace dialogue a chance to succeed but during the interlude, it provided finishing touches to its military operations plan, which came in the shape of “Zarb-e-Azb”. It also consulted its allies regarding possible military action lest the talks failed to reach a positive conclusion. It is to the government’s credit that its allies were on board with the decision and have provided moral support. The failed peace talks exposed the ugly face of the terror groups and the battered people of Pakistan have also put their weight behind the military operation and are wholeheartedly supporting the government and the military and now desire to see a conclusive end to the reign of terror. The detestable plot and atrocious conspiracy hatched by Pakistan’s detractors to engage the nexus of terror mongers is to conduct brutal attacks against Pakistan’s assets to fulfill sinister designs while simultaneously maligning us in the international community and destabilize our commercial hub. Pakistan’s economy, military as well as the will to remain united has been methodically targeted. 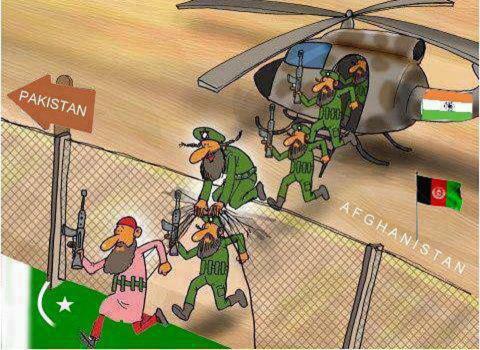 This situation is intolerable and while Pakistan military is raining precision guided munitions on the terror camps in North Waziristan and its ground forces are pounding them, we must take up the issue internationally at the diplomatic level to expose the terror nexus and its master minds, seeking reprisal or cessation of their machinations. This entry was posted on July 11, 2014 at 5:34 pm	and is filed under 1, Pakistan News, USA, India, Pakistan, Taliban, Al Qaeda, Terrorism, Terrorists, Army Operation, War On Terror. Tagged: BLA, CIA Operatives in Pakistan, ISI, Mullah Fazalullah, Pakistan Army Operation, pakistan operation Zarb-e-Azb, RAW in pakistan, Terrorism in Pakistan, TTP, War on Terrorism. You can follow any responses to this entry through the RSS 2.0 feed. You can leave a response, or trackback from your own site.